Do you cringe every time you’re asked to be part of a group photo because you’re afraid your teeth will stand out from the crowd of perfectly white smiles? These days it’s easy to feel like you’re the only person who is embarrassed of your not-so-pearly whites. If you’re looking for a way to brighten your smile, you may have heard about charcoal whitening – a seemingly easy and inexpensive option to whiten your teeth at home. If you’re wondering if this actually works or if it’s too good to be true, a cosmetic dentist in Oklahoma City discusses whether there’s any truth to this new trend. First, to understand how whitening works it’s helpful to know that there are two main types of staining: extrinsic and intrinsic. Extrinsic Stain – This type of stain lies on top of the teeth and can be removed with any polishing agent or toothpaste that contains an abrasive, gritty material. Intrinsic Stain – This occurs when the teeth are internally discolored, and is what people commonly think of as yellowing or discoloration. Because charcoal is abrasive, it will remove some extrinsic stains from things like coffee, tea, red wine or tobacco. However, it’s important to note that that same abrasive quality can wear away your enamel if used too much or incorrectly! Also, while it may remove stains from coffee or wine, it will not whiten your teeth. 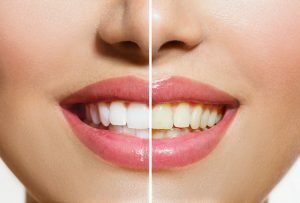 You must use a bleaching agent to change the color of your teeth if you’d like to change them from yellow to white. What Kinds of Whitening Options Do You Have? Zoom! Whitening – With this option, your teeth can be lightened up to 14 shades in around an hour. For fast, dramatic results that are long lasting, this is your best bet. Take-home Trays – After molds are made, you’ll take home custom-made trays and a whitening gel to use until you have the results you want (typically in 1-2 weeks.) This option can lighten your teeth up to 10 shades and gives you more control over the process. Crowns or Veneers – This option is helpful if you have hard-to-whiten teeth, such as teeth that have been discolored from tetracycline or other developmental issues. If you’ve decided that you’d like to take advantage of all the confidence that comes with a bright smile, a great first step is scheduling a consultation with a dentist in OKC. At this visit you can discuss your goals and which treatment is best for you. With your new smile, you’ll never want to shy away from those group photos again! Dr. Joe Isaacson is a general, restorative and cosmetic dentist who gets immense professional satisfaction from helping his patients have the smile they’ve always wanted. He’s won numerous awards for his achievements in dentistry and is consistently rated as one of the top dentists in Oklahoma City. He can be reached for questions through his website, or at (405) 943-8575.